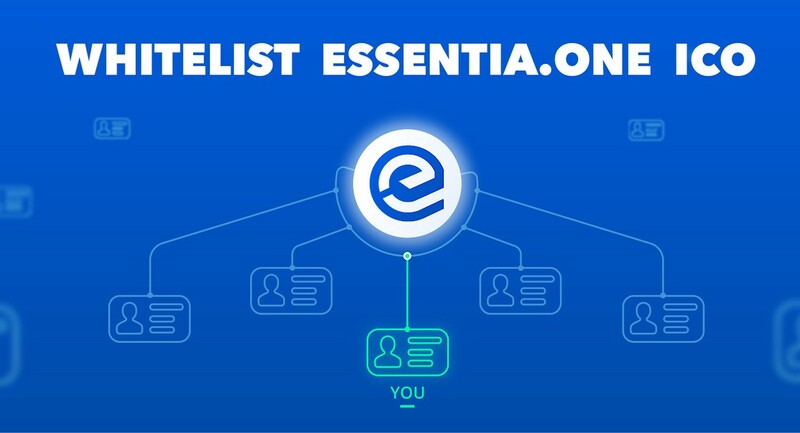 The work is humming in Essentia’s offices, and besides working on development, apps integration or meeting governments, we’ve been preparing a new member area and the whitelisting process. 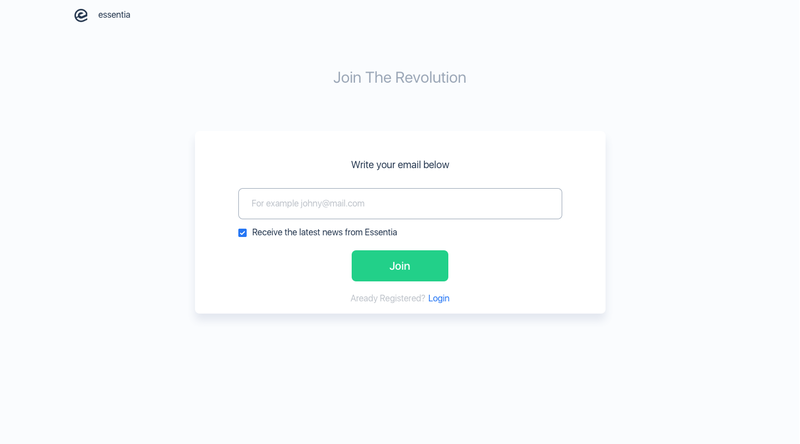 So now, the Essentia whitelist is officially open at Essentia.one. This means we are inviting you to join us on the exciting journey towards a new, decentralized world. One of privacy, security and ownership. To make your life a bit easier, we have prepared a detailed guide on how to join the whitelist and what you can expect next. 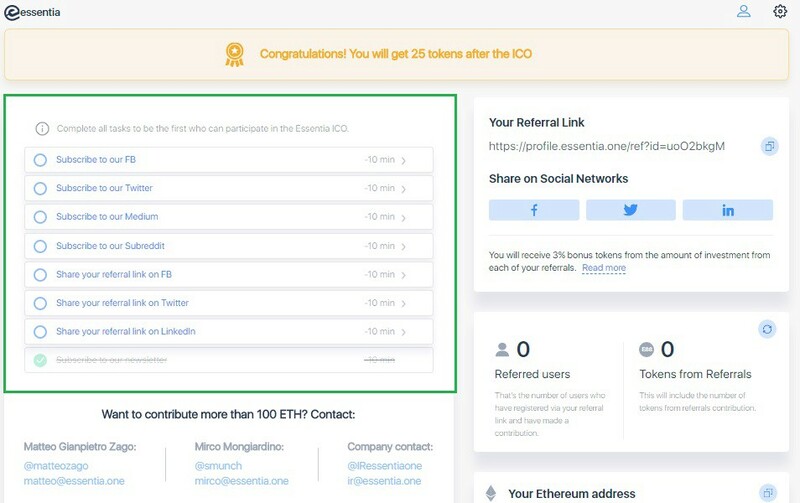 Only people who joined the Essentia Whitelist will be able to participate in the pre-ICO, ICO and future Airdrops. Don’t miss this chance to experience a new way of interaction with the Internet. Join thousands of others and get whitelisted now! Now let’s get straight down to business. When you click on “Join whitelist” button on the website, you will be asked to insert your email. It’s important to pay attention that everything is correct. If you have already registered earlier, please, click login to proceed right to your Member Area. Also, check the “latest news” box. It will rid you of some work later on. We’ll get back to that soon. 2. Now all you need to do is to verify your address. 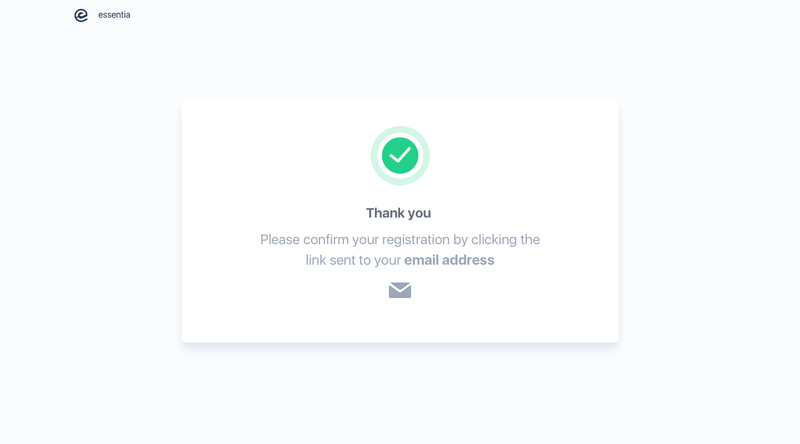 Login to your email and click the verification link. In the email, you will receive a password. Use it to log in to your Member Area. What is the Members Area? The first task is joining the whitelist. Click! 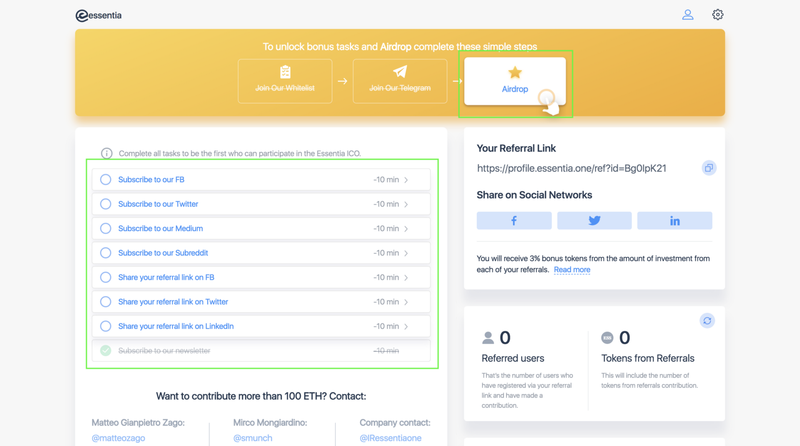 To do that you will need to add your Ethereum address. Insert your Ethereum address and the amount of ETH you will be contributing. The minimum is 0.1 ETH. Note: You can change this address a week before ICO starts. After that, it gets fixed in the smart contract. …and to write a few kind words about the project. Easy-peasy! After joining, please, come back to the site and click “Continue”. Then you’ll be able to go on completing the tasks. The last thing to do is to get your ESS tokens. They will be sent to you right after the ICO ends. Now when everything is said and done let’s get to the real business, shall we? 3. This is how your member area looks like when it’s completely verified. Now you can see that all the tasks are activated. Why complete the tasks ? Completing each task brings you 10 minutes nearer to the ICO. All done — you are an hour and a half ahead of everybody else, making you one of the first in line. 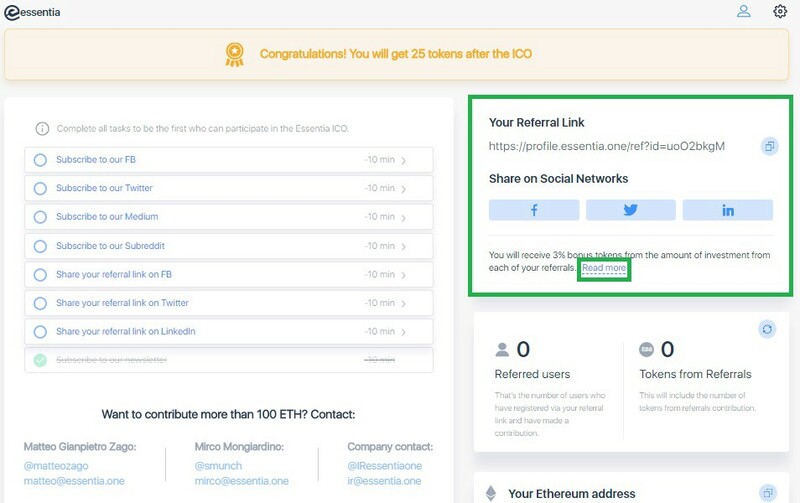 This way you ensure you don’t miss a chance to participate in the ICO. 4. Among the tasks, you can also find “Join Newsletter”. Remember you were checking the box while whitelisting? If you haven’t done it then, you have a chance now. 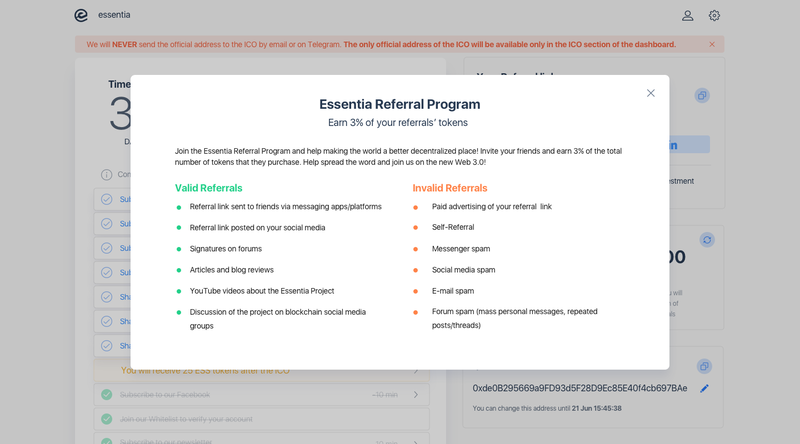 Let us also highlight the referral program, which you can also find in the Members Area. If you click on Read More, you will see a set of rules. We highly recommend you go through them to avoid any misunderstandings. Invite your friends to become revolutionaries with us. We hope you find your questions answered on this guide, but if we missed anything at all, just ping us on any social channel. We are always happy to help. If you’ve finished the whitelisting process the next step for you is the KYC/AML procedure. Make sure to check our guide first to avoid any inconveniences.